July 7, 2014 by C.S. Clarke, Ph.D. Despite the recent hilarity over the FBI’s “exhaustive” — and almost useless — list of Twitter and texter slang and shorthand, there’s a serious, practical use for a real, standardized shorthand. For all your computerized devices. Did you know that abc style shorthand is back again? Sort of. Are you familiar with abc shorthand? 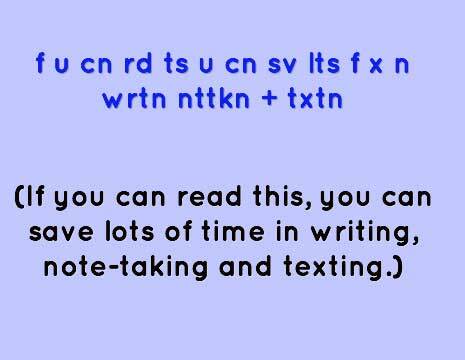 It uses the English alphabet, a few extra symbols and the dropping of vowels to shorten words and make it faster to write and take notes. If you don’t know how to write a particular word in shorthand, you can just write it in longhand. Easy. Easy. Easy. Or should I write e-z? One of its most outstanding features is that you can do it with a pencil or a keyboard. Any kind of keyboard. Including smartphone keyboards. Many folks who learned abc shorthand are still using it for note-taking. Especially people like news reporters. Many old-school reporters still use a form of abbreviations that really could be considered shorthand. But the new users are texters and tweeters. Especially teen texters. There’s a growing standardization of sets of common abbreviations that are fairly intuitive and easy to read. Now, I don’t mean only the slang abbreviations like LOL or IMHO. The slang is hardly intuitive or easy. No, I mean the intuitive abbreviations of many common words, like cn for can. Or u for you. They are very like the various abc shorthands. Most of this new shorthand is still in the formation stages, with the slang still holding sway. But it’s growing. And it’s sensible. Useable. Practical. For everyone. If you’re going to write with your thumbs, it’s almost mandatory to learn a system that will let you write more quickly and easily. So even if you don’t tweet or chat, if you don’t know the “shorthand,” you’re already behind times. Maybe it’s time to learn the most used modern slang, abbreviations and shorthand of the new communications media. Because, at the very least, with the growing use of smart phones, you’re going to want it for texting, email and other uses on your mobile phone. ABC shorthand systems are so easy that most people can figure out what you’re writing, whether they know the system or not. That was made quite clear many years ago when the ads for courses for those systems read like this: “f u cn rd this u cn mk a gd lvng.” Most people understood the abbreviations immediately and were encouraged to add the skills to their repertoire. In the days those systems were being developed, having shorthand or stenographic skills could mean a much higher paycheck. For both men and women. The best part of learning abc shorthand was that you could buy a book and learn it on your own. When I was in college, I had day jobs and went to school at night. I got most of my work in offices, because I had learned to type in high school. Although I missed (by a long shot) the heyday of the rush to use abc shorthand, it was still in use and stenographic skills were still highly valued. I got myself a book on abc shorthand and added that to my skills. I did, indeed, get higher paying jobs. It was easy and fast. It only took about three weeks of learning and practice, on my own, to be able to take notes or dictation. In very short order I could write at 80 words per minute. It made note-taking in class a breeze. If I wasn’t in the office, most people there could read my notes, since the principles of the system were so obvious that they could figure out what I meant. So, you could take one of the old systems and just add the most-used slang, abbreviations, acronyms and symbols to it, and you’d have an easy-to-use texting/chatting/tweeting language that is fast, fast, fast way to type. 50-80 words per minute, what will happen to the speed if you add abc shorthand to keyboarding? You’d also be able to write articles, books, emails and other documents quickly in the shorthand — by hand, by keyboard, or by mobile device — and then have them transcribed. Or, perhaps, dictate them from your notes into one of the Nuance dictation programs. Sure, it’s best to do dictation directly, but what if you were away from your computer when a great idea hit you? Yay shorthand. No matter where you are, if you have a fast, easy shorthand typing system, you can open your browser on your mobile device, go to your web mail, write what you want and send it to yourself or your transcriber, and it’s done. Stuck in a two hour traffic jam and you have a report due? Write it in web mail and send it off for later transcription. You’re productive anywhere. Of course, there’s still the overwhelming advantage you’d have as a texter on your smartphone. There aren’t any books of instruction in any of the styles of abc shorthand that I can be sure are in the public domain. So, I don’t have any free ones for you to download. However, there are plenty of texts, both old and new, that you can use to teach yourself one or more of the systems. They’re all based on the same principles. Just be careful, a lot of books that are billed as abc or alphabetical shorthand are actually symbolic shorthand. Look for “Speedwriting.” That’s one of the best known and standard styles. How to Write Faster — http://www.wikihow.com/Write-Faster — Includes both shorthand techniques for actually putting words on paper (or digital paper) and suggestions for composing written documents faster. Easy Text Shortcuts You Should Be Using — http://www.apartmenttherapy.com/x-text-shortcuts-you-should-be-using-176907 — As an alternative to sending shorthand, you can use text expansion apps. These apps allow you to type in the app’s “shorthand” and the app outputs the full word. Tironian notes — http://en.wikipedia.org/wiki/Tironian_notes — For fun, here’s a shorthand system than goes back to Cicero (yeah, that guy from the time of Julius Caesar). His scribe, Marcus Tullius Tiro, invented it. A Shorthand Dictionary, J.B. Dimbleby. — http://superperformance.com/oldbooks/shorthanddictionary.pdf –Just to have a measure of how long abc shorthand has been used, here’s a book from 1868 that lists the vowels-removed-shorthand for English words. The FBI’s Guide To Twitter Slang Is Hilarious? — This is a “cover your face with your hand and groan” kind of funny. April 22, 2014 April 6, 2014 by C.S. Clarke, Ph.D.
Isn’t that a smashing photo? 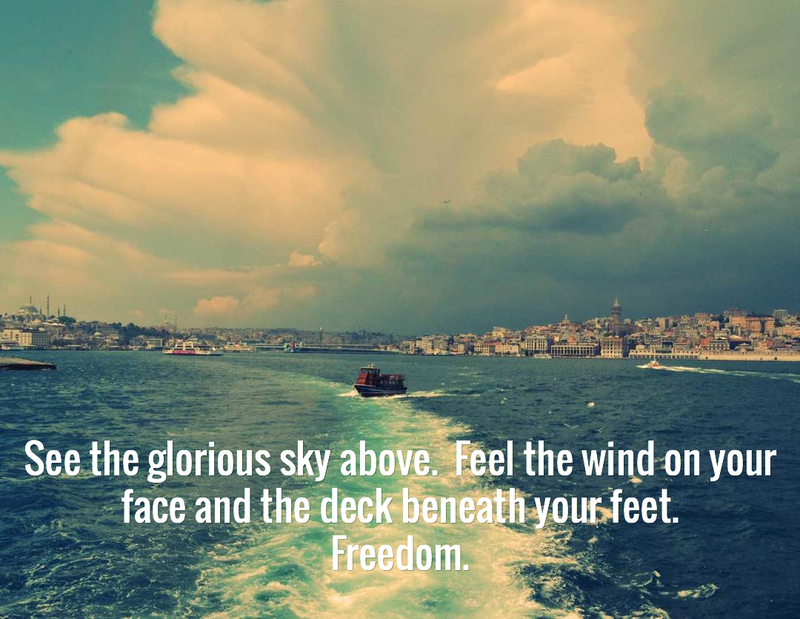 I created the text/photo combination in a couple of minutes and downloaded it for this blog. You could have it on your own blog. Or as a visual tweet. Or on Facebook. Or whatever. It’s pretty well-known that visuals create greater engagement than text alone. Much, much greater. It’s also well-known that visuals communicate a considerable amount more than text. That visuals keep your reader’s attention better than text alone. That visuals get people to stop long enough to actually read your text. But, back to the photo above. If you got it from the same source as I did, you could put your own words on it. Or a great quote. You could modify the photo. You could do many things with this and hundreds of thousands of other photos, vector drawings, textured backgrounds, color backgrounds, etc. And you can do that in minutes. You can then share it directly to social media and/or download it to use on your site or blog. ShareAsImage.com has a little web-based tool that lets you put some attention-getting text into a background and automatically share it. They provide the backgrounds and the text-creation device. So, for example, it you wanted to share a quote or create a quote from some article you were reading online, you’d just clip the text, hit the bookmarklet for ShareAsText, pick a photo or other background, paste it in, adjust the text block, hit the share or download button and be done. Boom! You’ve created a tweet with an image. Which will be more likely to be noticed and retweeted than simple text. Go try out ShareAsImage.com and if you like it, buy it at AppSumo. But you need to be quick to get the $25 price.